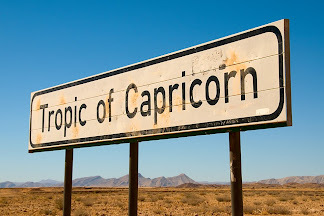 We had an early start today, leaving Swakopmund at 6:00 and driving seven hours into the vast Namib-Naukluft National Park in the middle of the Namib Desert – this is the oldest desert on Earth and home to some of its highest sand dunes. 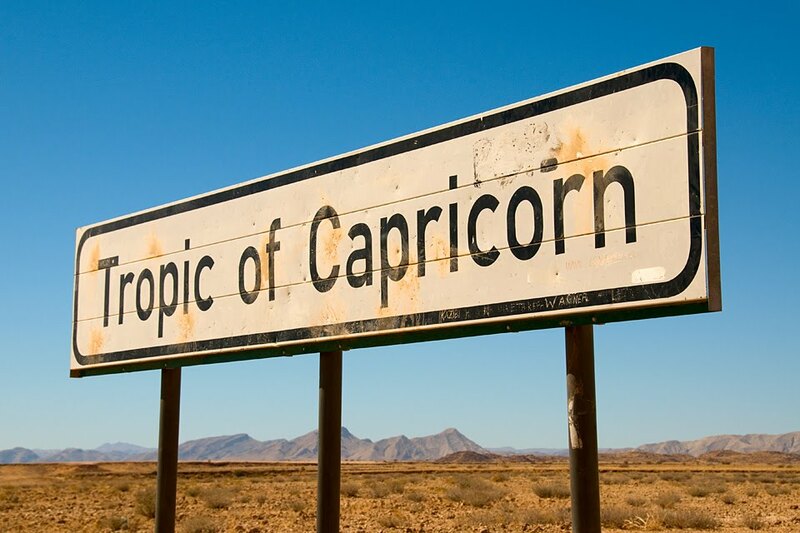 On the way, we stopped at the Tropic of Capricorn, thus having driven through the entire southern half of the tropics since leaving the equator in Uganda. 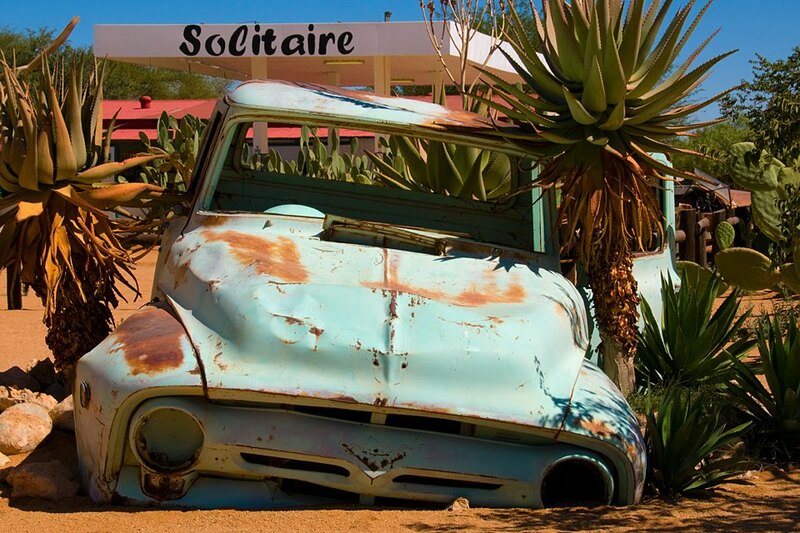 We also stopped at Solitaire, a fitting name for this dusty roadside stop decorated with abandoned antique cars – it feels like a place that could be on Route 66 in the States. 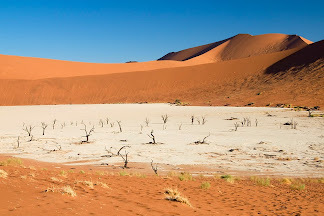 As we neared Sossusvlei, sand and dust blew in through the open sides of the truck, coating everything in a thin pale layer. My hair felt thick with sand, and the floor of the truck was yellow-white with gritty grime that had mixed with the mud tracked in from our shoes. 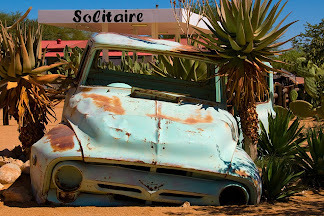 We ate lunch in the park and then jumped into the back of a truck that would take us to Sossusvlei, a famous dry clay pan featured on many of the glossy travel brochures of Namibia. One fast, bumpy, terrifying ride later we arrived at our destination. Our guide was a very informative local who knows everything there is to know about the Namib Desert. He told us a geological history of the area, explaining how the winds shape the dunes. 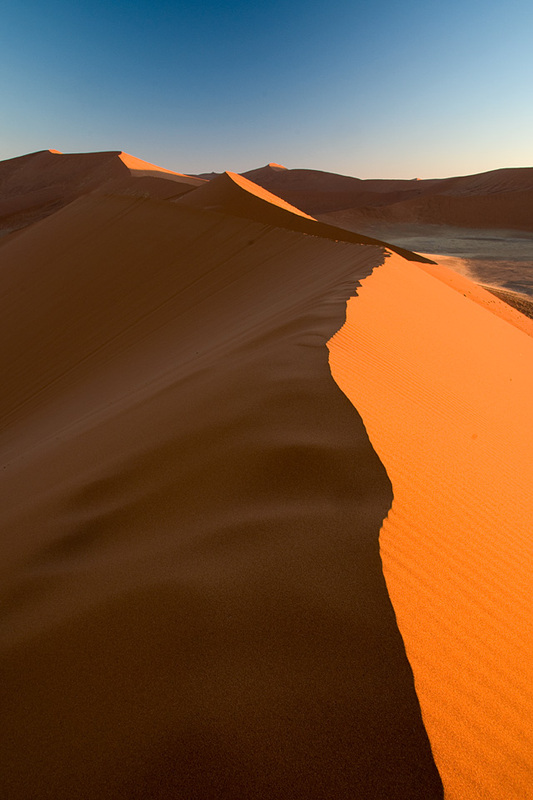 The intense orange color of the dunes is due to their age: over time, iron in the sand oxidizes and turns the dunes a rusty color. Our guide demonstrated this high iron content by sifting a magnet through the sand and pulling away clumps of iron. He showed us unique methods for finding water, and he identified which critters could kill you and which ones you could eat. As we painstakingly trudged through the soft sand, we ruined the perfect wind-shaped ripples with our shoes. 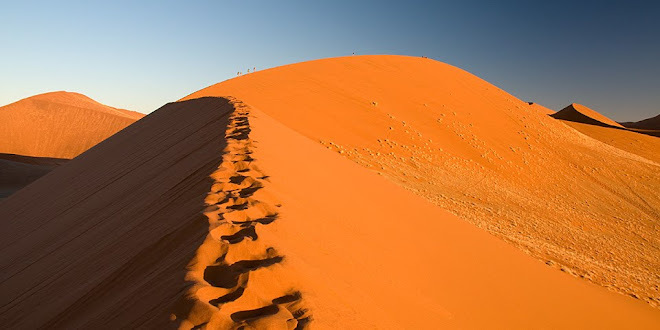 We eventually began to climb one of the dunes, and at the top was a haunting and desolate view of the Dead Vlei. This is another white clay pan populated only by the remnants of dead acacia trees. 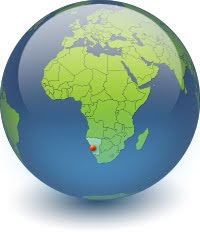 Long ago, the nearby Tsauchab River flooded, creating a lush area for acacia trees to thrive. 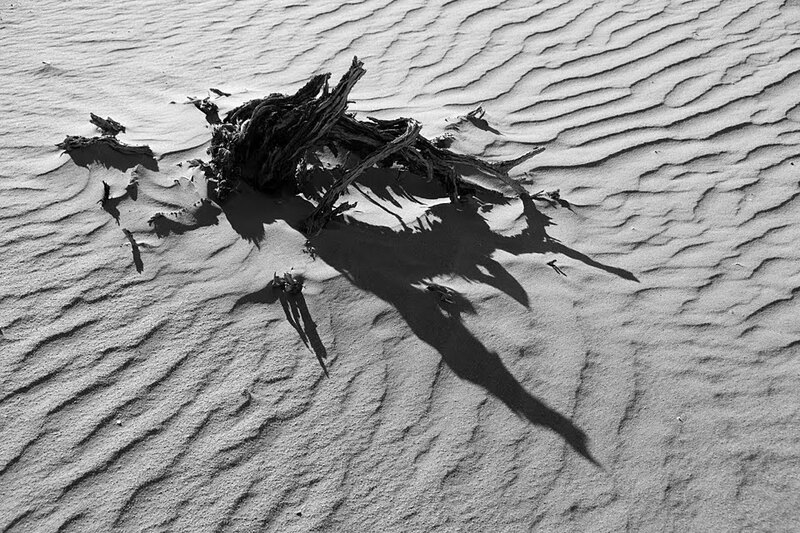 As the climate grew drier, the advancing dunes cut off all access to water, and the trees died. The sun-scorched skeletons of these trees are thought to be 900 years old, and the bone-dry climate has prevented the wood from decomposing. The Dead Vlei is three quarters of a mile across, but from a distance it looks like it could be crossed on foot in five minutes. Scale is deceiving in this land of crystal-clear air and proportion-warping sand dunes. Two dead acacia trees are dwarfed by the sand dunes surrounding the Dead Vlei in Namib-Naukluft National Park, Namibia. 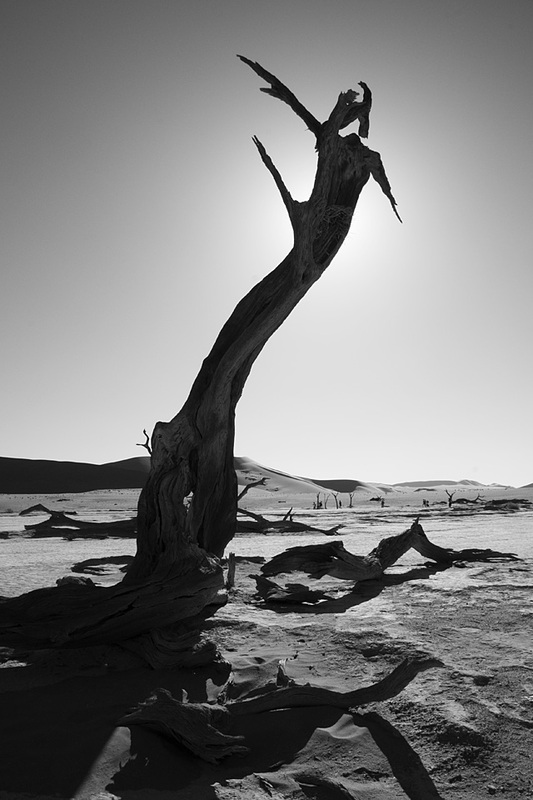 A dead acacia tree is silhouetted by the sun in the Dead Vlei in Namib-Naukluft National Park, Namibia. After our tour of the Dead Vlei, we returned to the truck and journeyed to Dune 45, which rises to a height of 550 feet. The idea was to climb the dune and watch the sunset from the top. Yet again, my perspective of the sheer size of the dune was skewed, as it did not seem very high at all. As I started climbing up the crest of the dune, each step grew more difficult as I labored through the thick, soft sand. The further I climbed, the larger the dune seemed to grow. I finally made it to the peak, where the razor-sharp spine of the dune snaked downward and off into the distance. 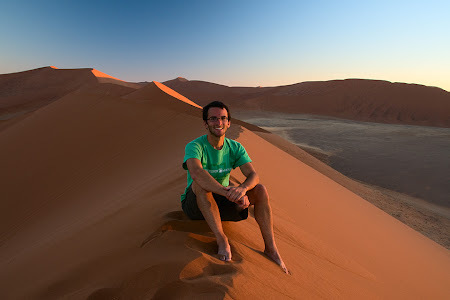 After the sun sank below the horizon, I descended the dune – this was a much easier task, as I could almost slip-slide my way back down in the loose sand. Finally, we made the short, dark drive to our campsite at the nearby town of Sesriem.